We got just under 100 responses to this survey, and it’s time to tally up the results. 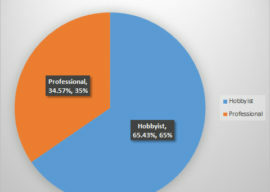 About 65% of our respondents are Hobby Router users and 35% are Professionals. That’s a pretty decent mix, skewed more to the Hobby side than our usual surveys. 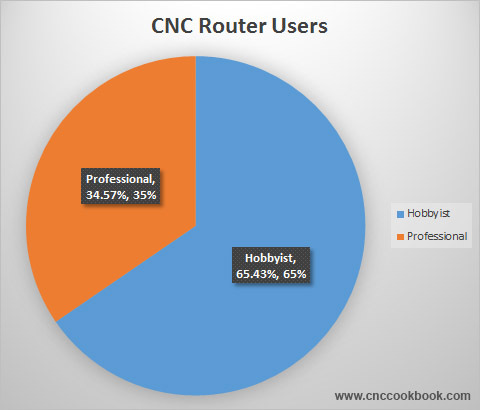 Overall, CNCCookbook’s audience is about 70% Professional and 30% Hobby. After those relatively big players, the market is very fragmented. Clearly the homebrew market is very large. 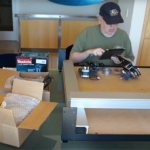 With all the kits and parts that are available, it’s pretty straightforward to build your own CNC router, and not all that expensive. 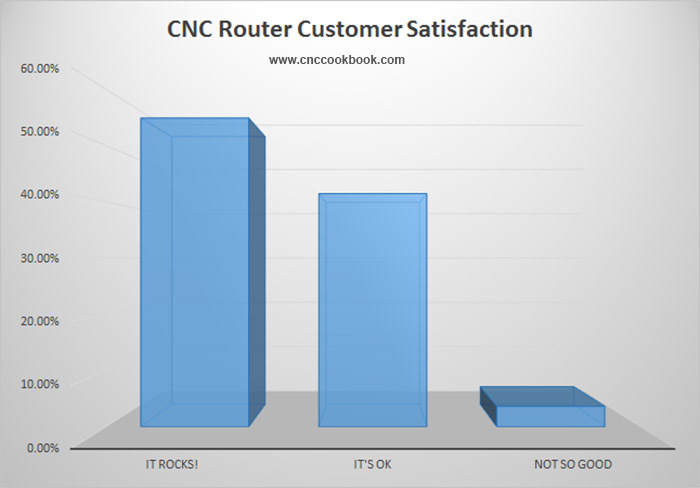 I read the overall customer satisfaction in the same way I felt when I got my first CNC machine to work–‘Tis better to have a CNC than not, but a lot! 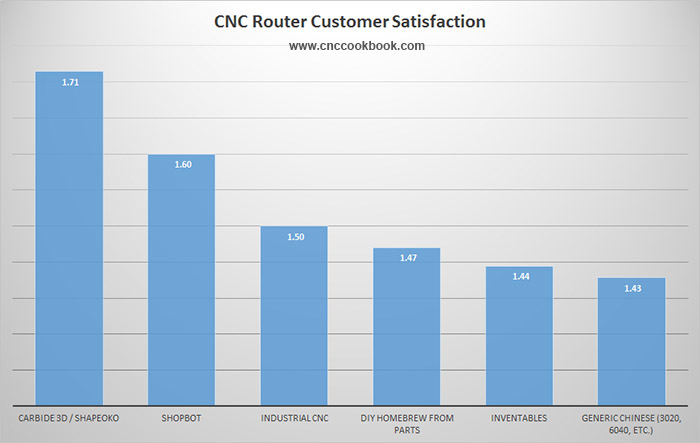 In general, folks are pretty happy with their CNC Routers. You can do a lot with one, even an inexpensive one. The scores represent the average Customer Satisfaction rating given, so a score of 2.0 = It Rocks!, 1.0 = It’s OK, and 0.0 = Not So Good. 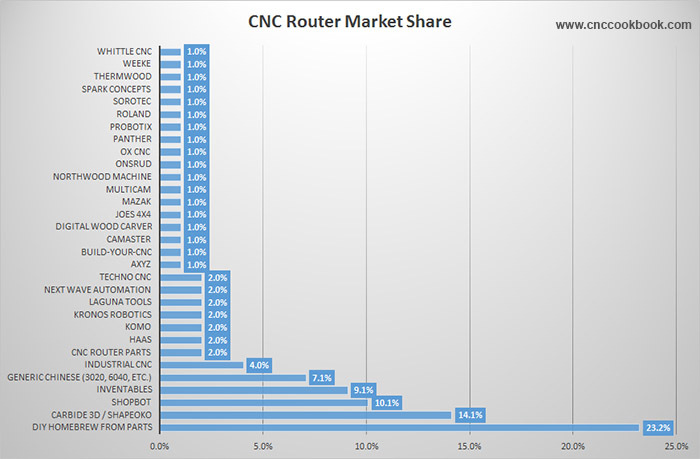 As we can see, the Carbide3D/Shapeoko users are extremely happy with their CNC Routers, handily beating everyone else. 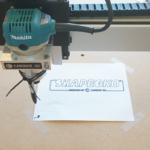 Shopbot owners are also quite happy. In general, every audience sees their machines as being better than just “OK”, which is why these 6 are the market leaders I suspect. If I was looking into acquiring a CNC Router, I would definitely want to have this kind of information at hand to narrow my choices. 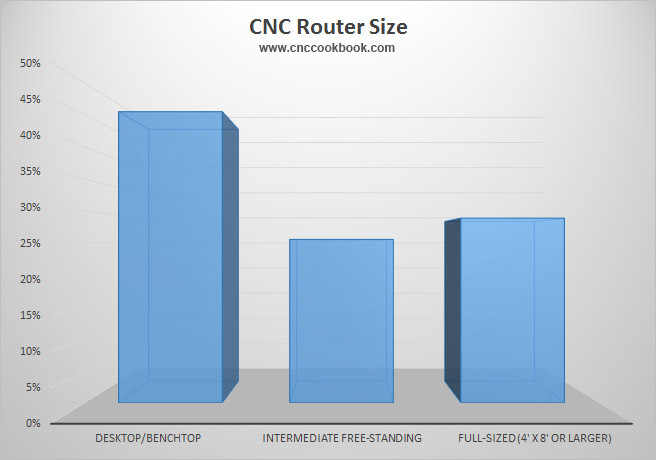 Router sizes ran the gamut, with about half being desktops, and the other half being free-standing, with a little over half of those being 4′ x 8′ or larger. We even had one mammoth 144″ x 400″ machine. I’d like to see that one in operation some time! 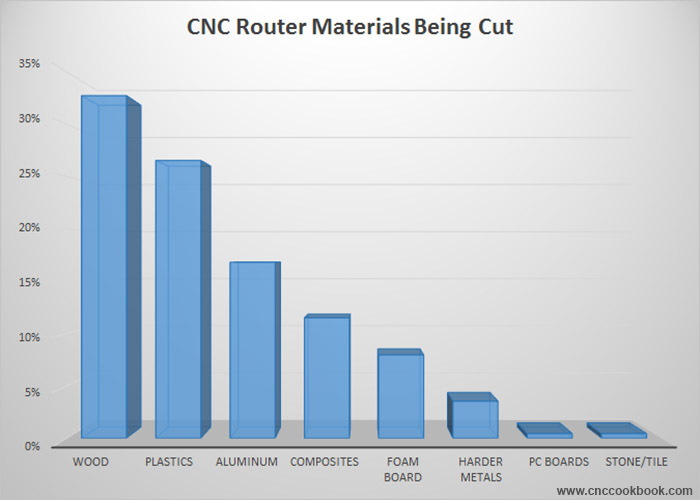 Clearly a lot of CNC Routers spend their time on wood and plastics, but a fair number are cutting aluminum, composites, foam board, and even harder metals. 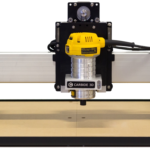 Most any CNC Router, even a lightweight one, will cut soft materials. They can even cut aluminum if you understand the secrets behind how to cut aluminum on a CNC Router. The trick to harder materials is how slow the router spindle can go. Even the toughest carbide coated cutters have to spin relatively slowly on tough metals. 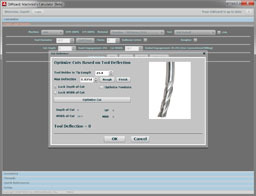 A tool like our G-Wizard Calculator will help you to map out exactly which materials the performance envelope of your CNC Router can accommodate. 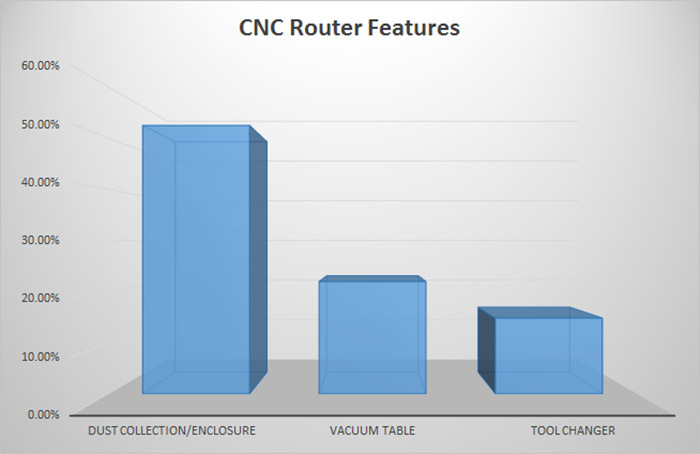 Stay tuned–next week we’ll do a second installment of survey results where we talk about the 3 things people liked and disliked about their routers as well as what folks are making on their CNC Routers. The best way to make sure you don’t miss out is to scroll down and make sure you’re enrolled in our weekly newsletter. Not only will we bring you a once-a-week digest of the articles we’ve written, but we’ll also connect you up with a number of items of bonus content that you can’t get any other way. 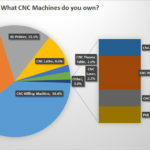 Things like the details of our recent CAD and CAM software surveys and our Big CNC Tip List of over 200 tips. So go ahead, give us your email right below and we’ll hook you up.